(CNN) -- CNN.com profiles the leading parties and party leaders ahead of Tuesday's Israeli elections. Barak was the most decoarted soldier in Israeli history on his retirement from the military in 1995. Opposite Likud, the Labor Party has been a dominant force in Israeli politics since its creation in the late 1960s and the leading voice of the Israeli left. Its social democratic principles draw strong support among the secular Ashkenazi community -- Jews of European descent -- as well as among Kibbutzniks, religious Zionists and Israeli Arabs. The party has long supported a two-state solution to the Palestinian question, along with the removal of isolated settlements and the completion of the security barrier. It wants to restart negotiations with moderate Palestinian leaders based upon the "land for peace" formula within the framework of the Oslo Accords, signed in 1993 by the then-Labor prime minister Yitzhak Rabin, who was subsequently assassinated in 1995. However, Labor says it will not negotiate directly with Hamas, which currently controls Gaza, unless it agrees to renounce violence, recognize the state of Israel and abide by existing agreements. Economically, Labor favors increasing the minimum wage, guaranteeing pensions to every employee, and increasing social security benefits for the elderly and the handicapped. Since 2006, Labor has been a member of the Kadima-led coalition with party leader and former prime minister Ehud Barak serving as defense minister in Ehud Olmert's cabinet. With polls suggesting a swing to the right, Labor faces a tough time defending its 19 Knesset seats in the February 10 election. 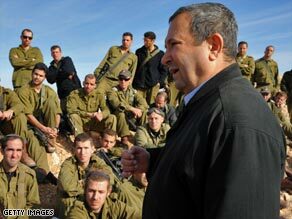 Ehud Barak entered Israeli politics following a distinguished military career, fighting in both the Six-Day and Yom Kippur wars and later leading an elite commando unit. He went on to serve as head of military intelligence and as chief of staff; by the time he retired in 1995 he was the most decorated soldier in Israeli history. Having already held a series of ministerial posts under Yitzhak Rabin, Barak was elected to the Knesset in 1996 and became Labor Party leader the following year. In 1999 he ran against and beat the incumbent prime minister, Benjamin Netanyahu, as the candidate for the leftist "One Israel" coalition block, which promised investment in health and education and better relations with Israel's Arab neighbors. As Prime Minister, Barak initiated fresh peace talks with both Syria and Palestinian leader Yasser Arafat. He also ended Israel's 17-year occupation of southern Lebanon. But the outbreak of the Second Intifada and waves of suicide bombings in Israel led to the collapse of his governing coalition and new elections in 2001 in which he was heavily defeated by Likud's Ariel Sharon. Barak subsequently quit both the Labor leadership and the Knesset. But he returned to frontline politics in 2005 and was re-elected as party leader in 2007. He has served as defense minister in Ehud Olmert's Kadima-led cabinet since July 2007, winning praise for his leadership during Israeli forces' recent campaign against Hamas in Gaza.